When you have a finished piece of writing, the best thing you can do is show it off and share it with the world. It’s important to have a platform where potential clients and raving fans can read what you write. Whether you’re starting with Journo Portfolio for the first time or you just need to give your existing portfolio a refresh, you’ll love these tips for perfecting your portfolio. The first thing you get to do is choose a Journo Portfolio theme that suits your work and style. With eight different themes to choose from and lots of customizable options, there’s a theme for everyone. If you’d like your Journo Portfolio to act as your main writing website, the Dark theme is structured like a typical website with a top navigation. For the minimalists, the White theme displays articles in a clean vertical list. 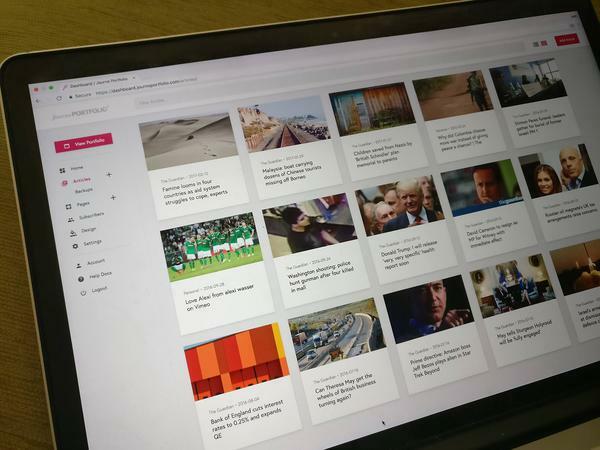 If you have great images to go with your articles, the Respond theme shows off your images with a modern grid layout. Once you’ve chosen your theme, you’ll be able to customize it with different fonts, colours, and images. After you’ve started your basic portfolio, it’s time to organize your articles. There are several ways to organize them, and choosing the right option makes your writing more inviting to readers. If you’re only planning on displaying a few of your very best articles, you can stick with a one-page site to keep it simple. You can also choose to create different pages for different publications that you’ve written for multiple times, or create a different page for every topic you write about. You know what they say - a picture is worth a thousand words. Journo Portfolio has a full library of images to choose from and there are also plenty of sites online that offer high-quality stock images for free. Use photos to make your portfolio stand out from the crowd. Use photos as a page background, header image, or feature image for an article. You can even try adding a slideshow or gallery, which will definitely make your portfolio more eye-catching. If you really want to get the most out of your portfolio, integrate the additional tools Journo Portfolio has made available. For keeping an eye on your website traffic, you can integrate Google Analytics with your portfolio and get access to all the raw data Google Analytics is famous for. With SumoMe integration, you can use advanced engagement tools such as a newsletter sign-up. Dig in and make use of features like social media links, the ability to auto-assign new articles, and more. Spending extra time to build and polish your portfolio will pay off when future editors, potential clients, and new fans are browsing your portfolio. The effort you put into perfecting your portfolio, along with the convenient tools Journo Portfolio offers, will make your portfolio stand out and get you more work.